I have to agree that movies tend to be dramatical sometimes, almost like soap opera. They extend an event, a fact that might be not that terrible, into a dramatic giant conspiracy. They may not have great success at the Box Office or in movie Critics, but for sure, it’s annoying ! I guess that’s the purpose : make people think! 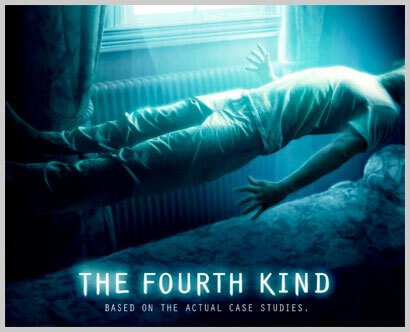 Yesterday, I watched “The Fourth kind”. I’m actress Milla Jovovich, and I will be portraying Dr. Abigail Tyler in The Fourth Kind. This film is a dramatization of events that occurred October 1st through the 9th of 2000, in the Northern Alaskan town of Nome. To better explain the events of this story, the director has included actual archived footage throughout the film. This footage was acquired from Nome psychologist Dr. Abigail Tyler, who has personally documented over 65 hours of video and audio materials during the time of the incidents. To better protect their privacy, we have changed the names and professions of many of the people involved. Every dramatized scene in this movie is supported by either archived audio, video or as it was related by Dr. Tyler during extensive interviews with the director. In the end, what you believe is yours to decide. Please be advised, that some of what you’re about to see is extremely disturbing. Abbey Tyler: An encounter in the first kind, that’s when you see a UFO. The second kind is when you see evidence of it: crop circles, radiation. The third kind is when you make contact. But the fourth kind, there’s nothing more frightening than the fourth. You see, that one is when they abduct you.